Ah the joys of adulthood. The holiday season is six months hence, but we're all grown up and there's no reason why we can't have presents whenever we want. So join us as we gleefully tear into Multi-Man Publishing's latest offering for Starter Kit Advanced Squad Leader -- Decision at Elst. 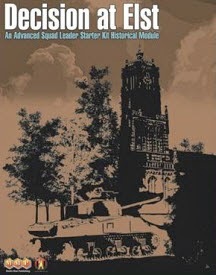 This is the first historical module for the Starter Kit series. You don't know what that means? Well then, listen. Or else. But we're not all fun and games here in the broadcast foxhole. Even we admit all play and no work would make us dull[er than usual], and in this spirit we knuckle-down with some serious brain exercises. So take off your helmet, don your thinking cap and play along with Dave, Dave and Mark as Jeff conducts another Quiz Show using the official Q&A from Avalon Hill. While supplies last you can get a fine ASL collector item and support The 2 Half-Squads podcast at the same time. To get your T2HS OBA/Playing Card Deck, email us at the2halfsquads at gmail dot com and we will send you the details. These have been very popular, so in the spirit of ASL they will soon become Out-of-Print for who knows how long! Erm, I think you've uploaded the previous episode. Excitement and then sheer dejection - bit like ASL. Robert, well said... especially your ASL connection. The Download Now link is fixed and we are working on the missing Listen Now buttons. What...a...difference..a day makes (tum-ti-tum) twenty-four little hours :-) Thanks for fixing the jukebox. Cheers Jeff and Dave! Just in time for Independence Day! Nice touch bringing back "Quiz Show". I hope you find the "old" intro for "What have you been playing lately". That always cracks me up! Have a nice holiday weekend!!! I completely understand why the starter kits aren't interesting to either of you. It's obvious that you have been playing with the full rules for years and don't play much besides ASL. For me, I love the starter kits. They allow me to play a relatively "simple" war game that is a lot of fun, but one that does not take all the energy away from playing other games of which I play many. Granted I am movely slowly to the full rule set, mostly because you can't play Japanese forces in the starter kits, but I will always enjoy the starter kit rules. So a little love from time to time is nice, but I don't expect it to be a focus. Thank you for your understanding, and we have good news. A reply of War of the Rats, coming your way very soon (although it is only Dave K vs. Dave K). Episode 118: The King is Dead!